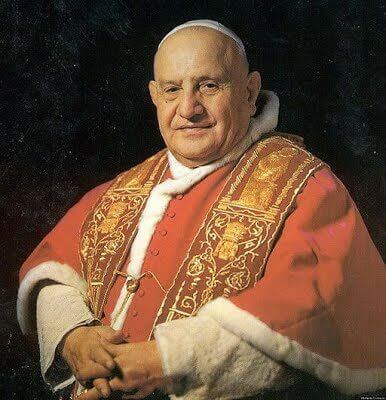 October 11 - St. John XXIII, pope - Optional Memorial - My Catholic Life! The first Pope John XXIII was an amoral antipope, one of three competing popes between 1409–1417, the confusing, final chapter of the Western Schism whose power struggles and political intrigues tore at the fabric of the Church between 1378–1417. When today’s saint was elected Bishop of Rome in 1958, being well versed in church history, he chose the name John XXIII to put to rest forever and always any lingering confusions about the historical status of the first John XXIII. Pope Saint John XXIII was born Angelo Roncalli into a large, humble, rural family in a mountainous region of northern Italy. He entered the local minor seminary at the age of eleven and persevered in his philosophical and theological studies, both locally and in Rome, until his ordination in 1904. Angelo had the good fortune to know, serve, and study under a succession of well-educated, charitable, and holy pastors. Both his formal and informal formation by the Church created in him the winning combination of rustic common sense, broad historical vision, and cultural openness that would mark his entire life. While his farm background certainly marked his personality, his stellar education, life of prayer, and total immersion in the rich Catholic life and history of his region truly formed him into a great man. After his ordination he became secretary to his bishop, a saintly and pastoral prelate whose total dedication left a deep impression on the young priest who was at his side for everything for almost ten years. Father Roncalli also edited a monthly journal, taught theology and history in the seminary, was a chaplain for various groups, and a medic and chaplain during World War I. His engaging personality and wisdom, above all, left a deep impression. He was, simply, an outstanding priest. In 1921 the Pope called him to Rome to serve the universal church in various roles, including as the Vatican representative in Bulgaria, Turkey, Greece, and then as the Apostolic Nuncio to Paris near the end of WWII and beyond. In 1953 he was made a Cardinal and Patriarch of Venice, and so returned to some of the direct pastoral duties he loved so much and which had been so reduced during his long administrative service to the Church. In October 1958 his accumulated knowledge and experience was placed at the service of the universal church, when at the age of seventy-six he was elected pope. He surprised the world soon afterward by calling for an Ecumenical Council, the meeting of all the world’s bishops that became known as Vatican II. As pope, he published some important social encyclicals, waded into the dawning theological debates of the Council, and then died in 1963, after reigning for only four and a half years. From the age of fourteen, John XXIII had kept a spiritual journal he allowed to be posthumously published as Journal of a Soul. It reveals a trusting soul with a deep love of Jesus Christ and the Church, a man aware of all the major currents of culture, a man of refined spirituality and profound humility. It reveals a saint. He had said that he wanted to be like Pope Saint Pius X—to be born poor and to die poor. In his last will and testament he left $20 to each of the members of his family still living. It was all he had. John XXIII was canonized on the same day as Pope Saint John Paul II on April 27, 2014. His feast day is not his date of birth, death, or ordination but the date of the opening session of Vatican II in 1962. His largely incorrupt body is visible to the faithful in a glass coffin in Saint Peter’s Basilica. Pope Saint John XXIII, may your long life of dedicated and selfless service to the Church and to her faithful be an example for all priests and bishops. May they see in you an example of the Good Shepherd who cares for his flock with wisdom and tenderness.